This new series, co-sponsored with The Center for Black Music Research of Columbia College, seeks to increase our understanding of black music genres and their importance to the cultures of the Atlantic world, including their influence on African musical styles. Books in the series will examine the wide-ranging music of the African diaspora—including the folk-derived musical styles of the Americas as well as European-influenced concert hall music of the entire black Atlantic world—by analyzing issues critical to our interpretation of the music itself and exploring the relationships between music and the other black expressive arts. Focusing on blues, jazz, gospel, rhythm and blues, and soul music, California Soul is one of the first books to explore the rich musical heritage of African Americans in California. The contributors describe in detail the individual artists, locales, groups, musical styles, and regional qualities, and the result is an important book that lays the groundwork for a whole new field of study. 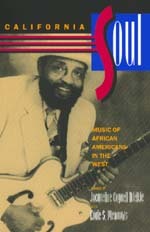 The essays draw from oral histories, music recordings, newspaper articles and advertisements, as well as population statistics to provide insightful discussions of topics like the California urban milieu's influence on gospel music, the development of the West Coast blues style, and the significance of Los Angeles's Central Avenue in the early days of jazz. Other essays offer perspectives on how individual musicians have been shaped by their African American heritage, and on the role of the record industry and radio in the making of music. In addition to the diverse range of essays, the book includes the most comprehensive bibliography now available on African American music and culture in California. Jacqueline Cogdell DjeDje is Professor of Ethnomusicology at the University of California, Los Angeles. She is the author of numerous monographs and articles on African and African American music and is editor of volumes 1 and 2 of African Musicology: Current Trends (1989, 1992). Eddie S. Meadows is Professor of Music at San Diego State University and the author of several jazz reference books, including Jazz Research and Performance Materials: A Selected Annotated Bibliography (1995).